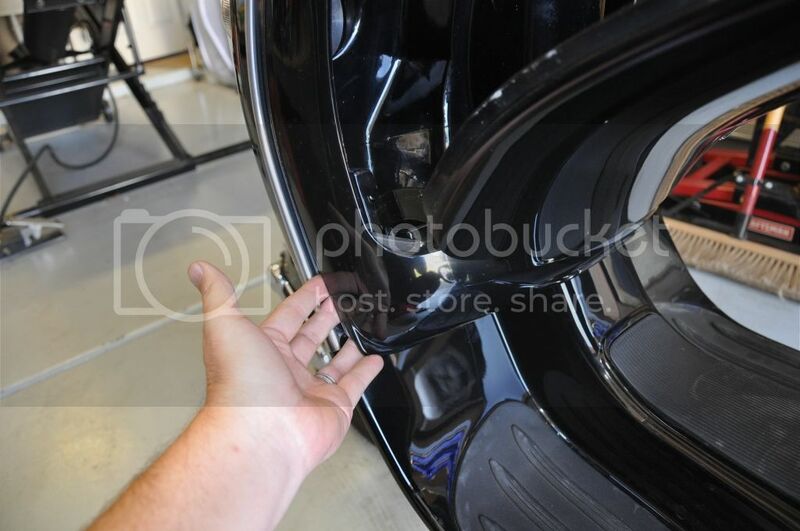 To Remove the horn cover you'll need your medium size flat blade screw driver. 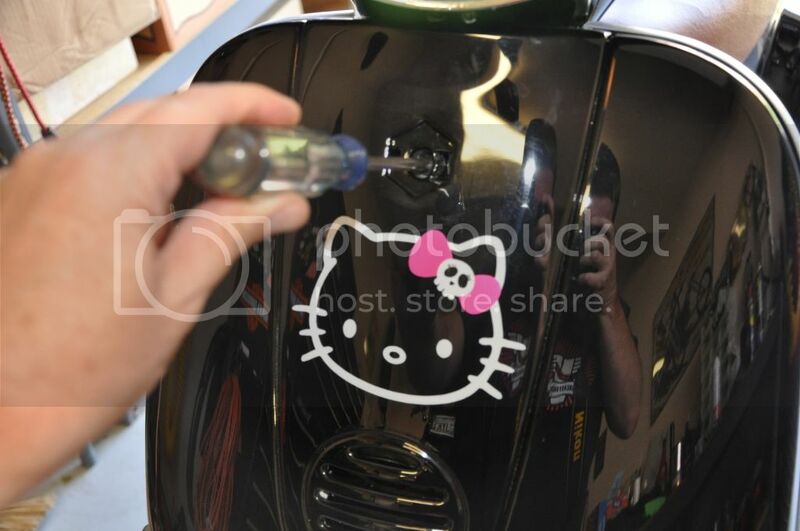 Cover the tip of the screwdriver with a bit of duct tape to protect the paint when you use it to remove the Piaggio emblem on the horn cover. 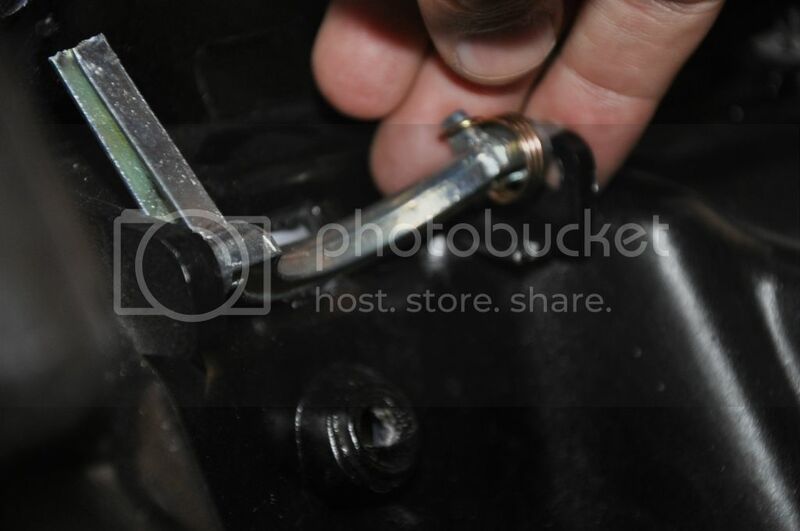 Insert the screw driver as shown in the photo and gently pry the emblem away from the horn cover. GENTLY! 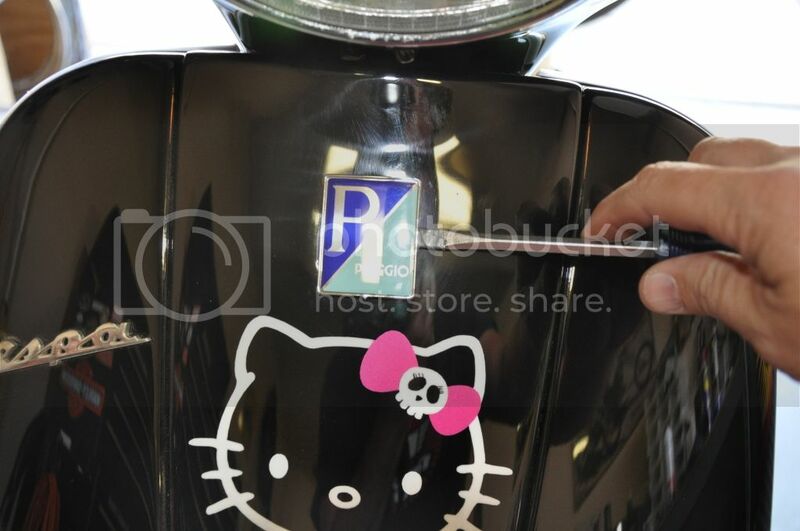 Use the phillips screwdriver to remove the screw that was behind the Piaggio emblem on the horn cover. 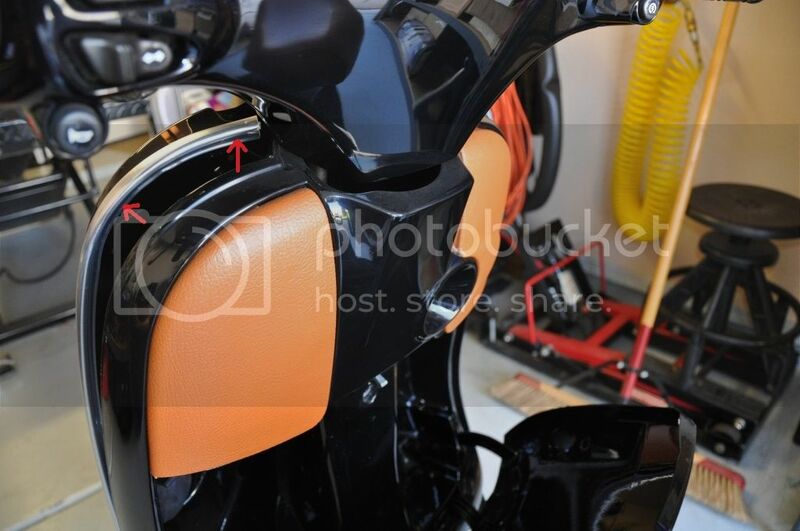 Turn the handle bars to the left to make it easier to remove the horn cover. Push down gently on the top of the horn cover while also pulling forward to remove it. If your latch is broken, you probably can't get the glovebox open by pressing on the key barrel. You'll need to activate the latch using the piece of wire mentioned in the tool list above. 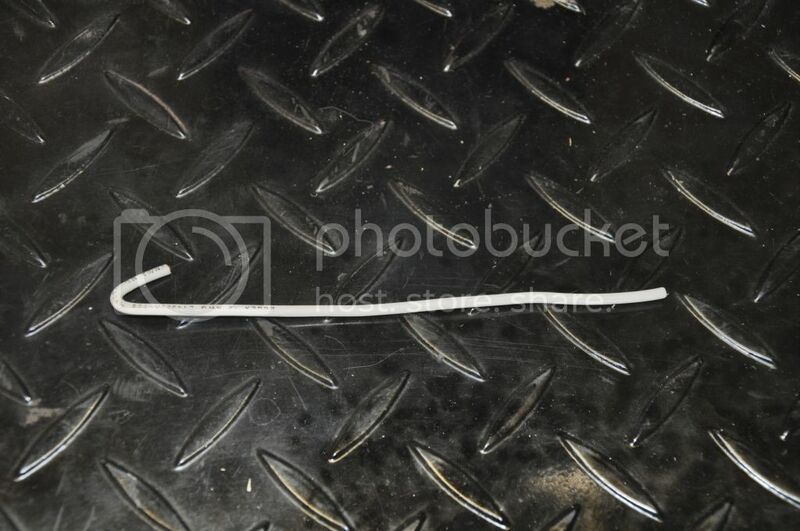 Bend the wire into a hook shape as shown. 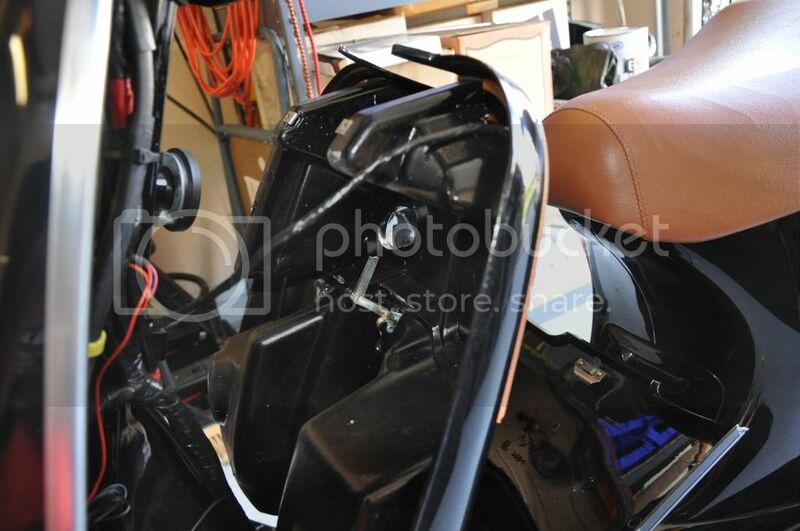 You need to activate the glove box latch by hooking it with the wire and pulling towards the front of the scooter. 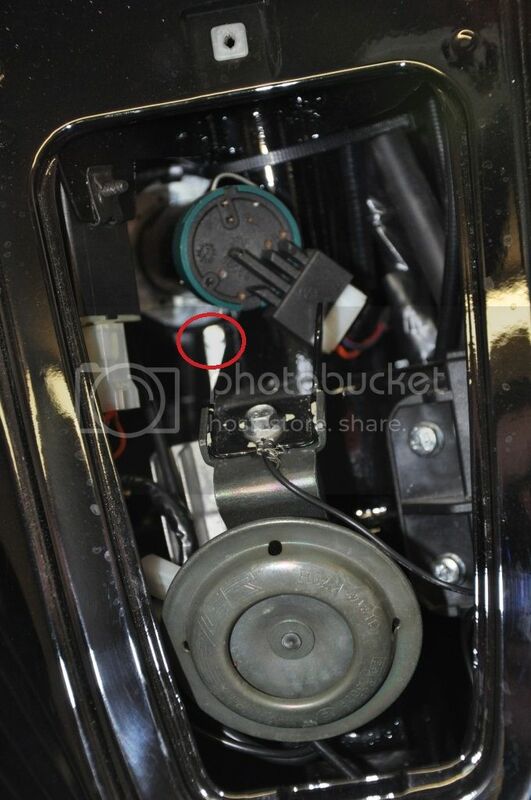 The item circled in red in the photo is the part of the latch you need to hook. 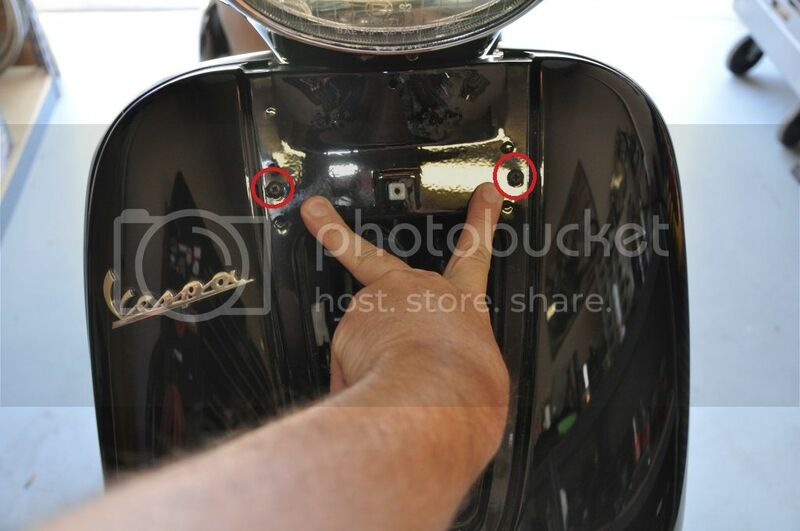 Using the wire hook, grab the latch and pull towards the front of the scooter. The latch should move and the glovebox should open. There are 5 screws you'll need to remove using the phillips screwdriver. Some of the screws might be easier to remove using the short phillips screwdriver called out in the tool list above. 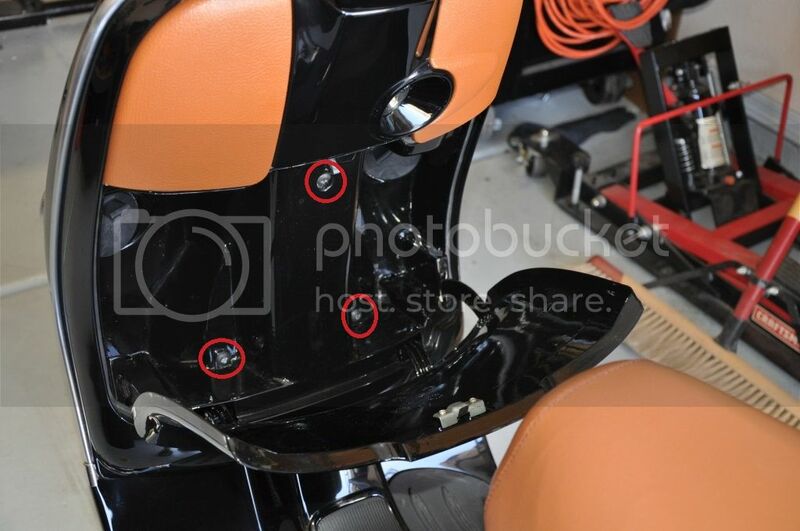 The screws that need to be removed are circled in red in the next two photos. Starting at the bottom of the glovebox using only your fingers gently pry the glovebox away from the scooter frame. The edge of the glovebox is gripped firmly by the silver trim along the edge of the leg shield. After the bottom is loosened continue working your way upward on each side of the glovebox until it is completely loose from the silver trim. Use caution so you don't scratch the glovebox or damage the leg shield trim. Once the glovebox is completely free, you can lean it back against the seat of the scooter. There is one electrical connection that will prevent you from completely removing the glovebox. If you need to get the glovebox completely out to remove and replace the broken latch, you can remove the left side knee pad from and disconnect the electrical component. This might make it easier to R&R the latch hook but it is not necessary as there is plenty of space to work with the electrical component still connected. The spring on the glovebox latch hook has a tab at each end. One end hooks to the latch, the other end hooks to the glovebox. It is easy to dislodge the end of the spring connected to the glovebox with the small flatblade screwdriver. In this photo the spring is still in place. When you have replaced the latch this is how the spring should be loaded. In this photo the spring has been disconnected and is hanging loose on the latch hook. You can remove the latch hook by lifting the end of the latch out of the slot. The entire latch with spring should come out very easily. No force required. Installation of the new latch hook is very simple. Put the spring from the old latch hook on the new one. Place the end of the latch hook without the spring into the hole in the glovebox where you removed the old latch hook. 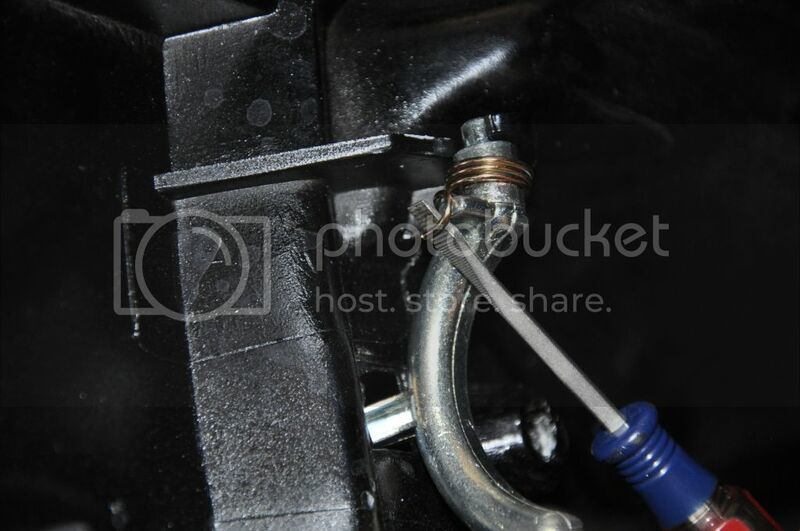 Make sure the hook part of the latch is poking through the hole in the glovebox so it can engage the glovebox door. 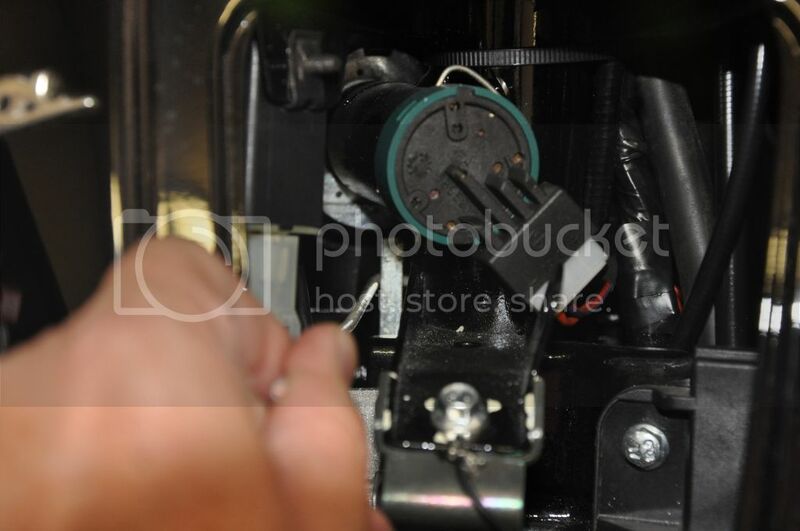 Set the end of the latch with the spring in the slot cut into the glovebox. Hook the end of the spring around the plastic tab molded into the glovebox. Using a flat blade screwdriver, pull the end of the spring around and hook it over the tab cast into the latch hook. Verify that the spring is working and if you pull the latch open it will return to the closed position. Now you simply need to put things back together. This might be the trickiest part of this repair. You need to reverse the process for removing the glovebox so you will start the installation at the top. 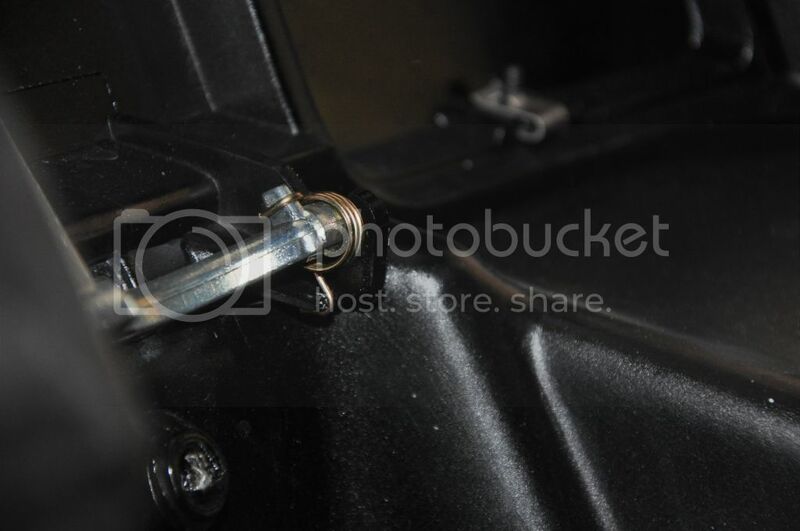 As you install the glovebox you need to get the latch hook you just installed around behind the key barrel so that when you press the key barrel it activates the latch. At the same time you need to get the key barrel aligned with the access hole in the glove box so that everything fits nicely together. Pictures won't help much here. It's just going to take a little patience and perhaps several tries to get things lined up. After you have the glovebox aligned, latch hook behind the key barrel and the key barrel properly aligned in the glovebox hole, start inserting the edge of the glovebox back into the lip that is part of the leg shield trim. Start at the top on one side working your way all the way to the bottom. Repeat this for the other side of the glove box. Be careful not to force the glovebox into the leg shield trim with too much force. You don't want to break the trim. After you have both sides in place, verify that the glove box latch is now working. Replace the 5 screws you removed when earlier. Turn the handlebars all the way to the left. 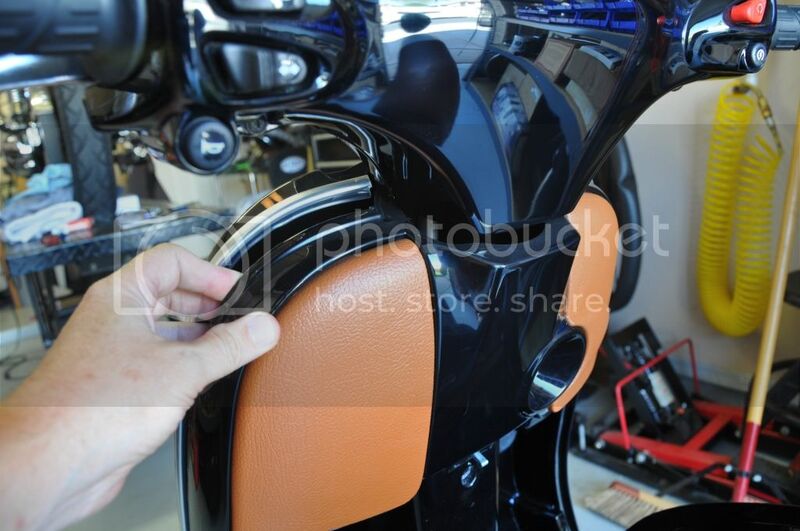 Begin by hooking the bottom end of the horn cover into the front of the leg shield. Gently push down and back on the top of the horn shield until it is in place. Install the screw that holds the horn cover in place. 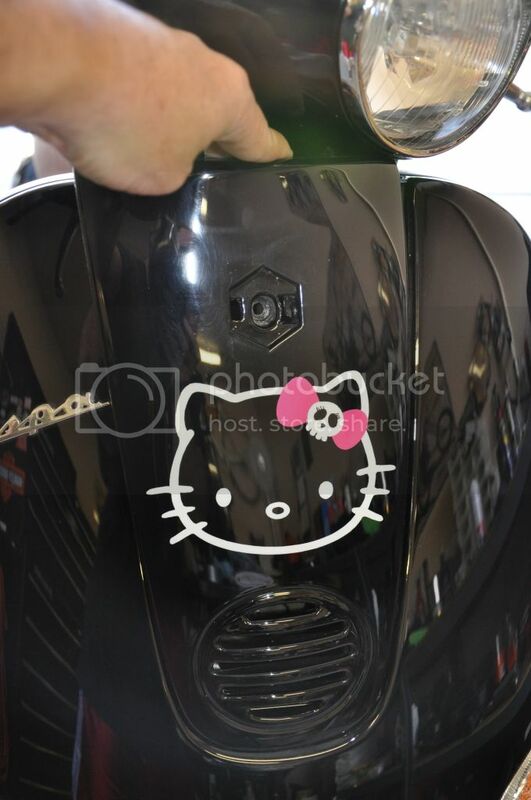 Reinstall the Piaggio emblem to hide the horn cover screw.